Business Accounts teacher for 11th and 12th grades. Located 1 and 1/4 hours from Bangalore; highly reputed, internationally known institution that transforms children from socially and economically deprived backgrounds into professionals and leaders of society. We are accredited to ICSE and ISC. We are featured in major publications including the New York Times, BBC, Outlook and Glamour: https://youtu.be/lUjMd8-axOQ. Recently featured in NETFLIX documentary Daughters of Destiny. Free housing, meals and housekeeping services in campus. Teachers are required to live on campus. 2 bedroom family quarters in campus for senior staff with extended family. Free education for the children of staff at Shanti Bhavan. Small classes (maximum 24 students per class); International standards. State-of-the-art resources including computers and Internet. Quiet, secure, pollution-free environment; 30 acres lush green secure campus. The opportunity to strive for social reform. 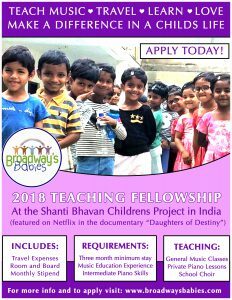 Teach music as a Broadway’s Babies Fellow at the Shanti Bhavan Children’s Project in Tamil-Nadu, India! Funded through the efforts of the Broadway community, the Broadway’s Babies fellowship provides primary music instructors for choir, private piano and voice lessons, and lower school general music education classes. Fellowship includes travel expenses (airfare and visa fees) and a monthly stipend commensurate with experience. Next position starting Late August/Early September. Minimum 3 months time commitment. Leading approximately twelve 45-minute general music education classes each week for students in grades 2-5. Teaching up to five hours of private piano/voice lessons (beginner to beginning-intermediate) each day for students in grades 6-12. Option to teach other instruments including drums, guitar, violin, flute, clarinet. Lead the school choir in three to four rehearsals each week. Planning and teaching age-appropriate and culturally-appropriate lessons that focus on the development of soft skills. Preparing choir performances as requested and needed by school administration. Saturdays and Sundays off• Regular collaboration and communication with Shanti Bhavan and Broadway’s Babies staff members. Support and implementation of school-wide behavior management techniques in the classroom. Requirements: must possess a minimum of a Bachelor’s degree in Music Performance or Education. To apply, email [email protected] with your resume and a brief cover letter. Note: Applicants posessing most but not all of the teaching qualifications (teaching private voice and piano lessons, teaching elementary music classes, leading the choir) are still encouraged to apply. The fellowship’s responsibilities can be shared by two simultaneous teachers with complimentary skill-sets.